Like many other civil court cases in the country, the Ram Janmabhoomi-Babri Masjid title suit has been hanging fire for six long decades. Even when it came close to conclusion, it was certain that if the decision of the Lucknow Bench of the Allahabad High Court went in favour of one of the parties, the other would go in appeal to the Supreme Court. The Supreme Court’s directive to the Central Forensic Science Laboratory, New Delhi, to submit a report to it on the status of facilities available in various forensic science laboratories in the country and the kind of scientific support being extended to the investigating agencies in the matter of detection of crime is timely and welcome. It is not surprising that Pakistan has substantially increased its defence budget. It has done so in the past also. What is alarming is that this has happened despite the fact that the outlays for development and non-development purposes have been reduced by nearly 50 per cent and 20 per cent respectively. Amidst a general deterioration in Sino-India relations in recent days, India has taken a particularly strong line on the Indian Ocean. Finally, the Indian government has acknowledged what many have been warning for years: China’s role in the Indian Ocean is growing at a rate that underlines much more than a normal expansion of capabilities. WHILE there are serious concerns in the entire country about the success of the Commonwealth Games, members of the Organising Committee seem smug that they have done the best they could in the seven years that they had at their disposal. I got talking to one of the leading lights. One of the innumerable suggestions being thrown up to combat Maoists in the red corridor is to recruit ex-servicemen on a three year contract to fight the insurgents, and to engage retired sappers to clear mines. Undoubtedly ex-servicemen are in need of financial support, but not desperate enough to take up any job. Certainly not as mercenary soldiers to be used as cannon fodder and then be discarded, despised and dumped, when the job is done. Like many other civil court cases in the country, the Ram Janmabhoomi-Babri Masjid title suit has been hanging fire for six long decades. Even when it came close to conclusion, it was certain that if the decision of the Lucknow Bench of the Allahabad High Court went in favour of one of the parties, the other would go in appeal to the Supreme Court. That would mean many more years of legal wrangling. Interestingly, the two main representatives of the Hindus and Muslims have expressed their willingness to accept the High Court order as the final and not go to the higher court. Ninety-year-old Hashim Ansari is the original and oldest surviving petitioner in the case, and Satyendra Das is the head priest of the makeshift Ram Janmabhoomi temple at the disputed site. They want this 60-year-old dispute to be “buried in Lucknow and not in Delhi”. One thing common in the local representatives of the two communities is that they have not let the legal dispute sour their relations. They maintain cordial ties and visit each other often. Moreover, they are also critical of political parties who stoke the communal fires for petty vote gains. Satyendra Das, who has been managing the Ram temple since 1992, even goes to the extent of saying that the “demolition of Babri Masjid has harmed Lord Ram, harmed Ayodhya and harmed us”. They are also unanimous that the nation is supreme. Their reasonable voices are very significant and deserve to be held out as an example. In sharp contrast to their sanity at the ground level, there are higher forces at work which would do anything to keep the communal cauldron boiling. They would be eager to appeal further in case of an unfavourable verdict. But all sane persons should prevail on them to bury the hatchet. All the political mileage that could be had from the issue has already been extracted. The common man is more concerned about his daily bread. One hopes that the leaders will desist from using the renewed interest in the subject for political gains. The Supreme Court’s directive to the Central Forensic Science Laboratory, New Delhi, to submit a report to it on the status of facilities available in various forensic science laboratories in the country and the kind of scientific support being extended to the investigating agencies in the matter of detection of crime is timely and welcome. A Bench consisting of Justice Markandey Katju and Justice T.S. Thakur has ruled that as the country does not have adequate forensic science laboratory facilities, investigations are poor and this, in turn, allows criminals to go scot- free. It said the situation in Western countries was quite the opposite when compared with India. In those countries, the authorities are able to make the best use of science and technology to investigate crimes. They also have hi-tech facilities to test the criminals’ fingerprints, DNA, blood and so on. The reason why India lags behind in proper investigation in criminal cases is because of the authorities’ failure to provide the investigators the necessary scientific training as also the equipment. While the apex court directive is expected to goad the government to take steps to streamline this vital discipline, all is not well with forensic scientists in the country. They suffer from lack of resources, poor infrastructure, understaffing, absence of proper national policies and support. Because of the lack of vision, forensic science has failed to develop when compared to other disciplines of pure and applied sciences. More important, owing to poor infrastructure and bleak career prospects, the forensic science laboratories in the country seem unable to attract talent. While it would be interesting to see what the Central Forensic Science Laboratory would report to the Supreme Court, the Union Government cannot overlook the imperative need to revitalise forensic science education in the universities to provide human resource to the forensic science laboratories. There is merit in the argument of some experts that these courses in the universities, instead of being run by police officials, should be entrusted to experts so that these institutions could be exposed to scientific culture, temper and vision. It is not surprising that Pakistan has substantially increased its defence budget. It has done so in the past also. What is alarming is that this has happened despite the fact that the outlays for development and non-development purposes have been reduced by nearly 50 per cent and 20 per cent respectively. The defence budget now stands at Rs 552 billion against the previous year’s Rs 442.2 billion. The argument that has been advanced for reducing the allocations for development purposes is that funds have been saved for the rehabilitation of the flood-hit. What a strange logic it is! Development projects can be allowed to suffer, but not the interests of the defence forces. The Pakistan government can justify it with the help of the “doctrine of necessity”, even if people consider it illogical. The increased defence outlays for the next fiscal have come to light before the formal presentation of the country’s budget because the government has presented a “country paper” to the International Monetary Fund as per its requirement for the grant of funds. Otherwise there was no way to get matters related to army operations disclosed, as Pakistan’s chief military spokesman has said. The defence forces have got their funds increased manifold on the pretext of fighting the Taliban, Al-Qaida and other such terrorist elements. That is alright, but this required a marginal rise. The most pressing requirement before Pakistan today is how to get the uprooted people rehabilitated. As the whole world knows, Pakistan has been faced with the worst kind of floods in its history. That is why it has got enormous donations from different countries despite the initial reservations. Increasing the defence allocations in such a situation cannot be justified. But the hard reality is that no government in Pakistan can go against the wishes of the armed forces. The argument goes that, after all, Pakistan is there in one piece because of its armed forces. So, looking after the military’s interests is the country’s primary responsibility. However, this is a flawed logic. No army can discharge its responsibilities properly if people turn against it. The Pakistan Army has already suffered considerable erosion in its image during the fight against the Taliban. It will imperil Pakistan’s existence if the army gets further alienated from the people. Amidst a general deterioration in Sino-India relations in recent days, India has taken a particularly strong line on the Indian Ocean. Finally, the Indian government has acknowledged what many have been warning for years: China’s role in the Indian Ocean is growing at a rate that underlines much more than a normal expansion of capabilities. External Affairs Minister S.M. Krishna has informed Parliament that “the Government of India has come to realise that China has been showing more than the normal interest in the Indian Ocean affairs.” He went on to assert that the government is “closely monitoring the Chinese intentions.” But monitoring the intentions of a state is a fool’s errand. Intentions cannot be empirically verified and even if one could determine China’s intentions today, there is no way to know what they will be in the future. What India should instead focus on is China’s rapidly rising naval capabilities in and around the Indian Ocean. For some time now Indian naval expansion has been undertaken with an eye on China. Yet India has nautical miles to go before it can catch up with its powerful neighbour, which has made some significant advances in the waters surrounding India. Just last year, China’s growing naval capability was on full display as it paraded its nuclear-powered submarines for the first time as part of the celebrations to mark the 60th anniversary of the People’s Liberation Army (PLA) navy. Gone was the reticence of yore when China was not ready to even admit that it had such capabilities. Chinese commanders are now openly talking about the need for nuclear submarines to safeguard the nation’s interests, and the Chinese navy, once the weakest of the three services, is now the focus of attention of the military modernisation programme that is being pursued with utmost seriousness. China’s navy is now considered the third-largest in the world, behind only the US and Russia, and superior to the Indian Navy in both qualitative and quantitative terms. The PLA navy has traditionally been a coastal force, and China has had a continental outlook to security. But with a rise in its economic might since the 1980s, Chinese interests have expanded and acquired a maritime orientation with the intention to project power into the Indian Ocean. China is investing far greater resources in the modernisation of its armed forces in general and its navy in particular than India seems either willing to undertake or capable of sustaining at present. China’s increasingly sophisticated submarine fleet could eventually be one of the world’s largest, and with a rapid accretion in its capabilities, including submarines, ballistic missiles and GPS-blocking technology, some are suggesting that China will increasingly have the capacity to challenge the US. Senior Chinese officials have indicated that China would be ready to build an aircraft carrier by the end of the decade as it is seen as being indispensable to protecting Chinese interests in oceans. Such intent to develop carrier capability marks a shift away from devoting the bulk of the PLA’s modernisation drive to the goal of capturing Taiwan. With a rise in China’s economic and political prowess, there has also been commensurate growth in its profile in the Indian Ocean region. China is acquiring naval bases along the crucial choke-points in the Indian Ocean, not only to serve its economic interests but also to enhance its strategic presence in the region. China realises that its maritime strength will give it the strategic leverage that it needs to emerge as the regional hegemon and a potential superpower — and there is enough evidence to suggest that China is comprehensively building up its maritime power in all dimensions. It is China’s growing dependence on maritime space and resources that is reflected in the country's aspirations to expand its influence and to ultimately dominate the strategic environment in the Indian Ocean region. China’s growing reliance on bases across the Indian Ocean region is a response to its perceived vulnerability, given the logistical constraints that it faces due to the distance of the Indian Ocean waters from its own area of operation. Given the immense geographical advantages that India enjoys in the Indian Ocean, China will find it very challenging to exert as much sway in the Indian Ocean as India can. But all the steps that China will take to protect and enhance its interests in the Indian Ocean region will generate apprehensions in India about Beijing’s real intentions, thereby engendering a classic security dilemma between the two Asian giants. Tensions are inherent in such an evolving strategic relationship as was underlined in an incident earlier this year when an Indian kilo-class submarine and Chinese warships, on their way to the Gulf of Aden to patrol the pirate-infested waters, reportedly got engaged in rounds of manoeuvring as they tried to test for weaknesses in each other’s sonar systems. The Chinese media reported that its warships forced the Indian submarine to the surface, which was strongly denied by the Indian Navy. Unless managed carefully, the potential for such incidents turning serious in the future remains high, especially as Sino-Indian naval competition is likely to intensify with the Indian and Chinese navies operating far from their shores. The battle to rule the waves in the Indian Ocean may have just begun. And India will have to do more than merely monitoring Chinese intentions. “Sporting traditions are very strong in our country. We always race against time. We win some, we lose some”. “Heavens have not fallen. You should understand that after lining so many pockets, it is very difficult to spare money to season sand with cement”. “No hassle. We will hang some ropes. Those wanting to cross the road will use them, Tarzan style. “All victims will not only be given Rs 10 lakh each but they will also be declared martyrs”. Terrorism and insurgency are not a new phenomenon but in recent years have come into special focus. Operations to tackle insurgencies and terrorism are above the level of peaceful coexistence but below that of war. Although not universal, this type of warfare underscores the capacity of the weak to impose considerable military and political pain on the strong. The aim of the terrorists is to change the perception of the populace and show the state in bad light. Their modus operandi is characterised by irrationality, indiscrimination, unpredictability and ruthless destruction. Regular forces usually fail to grasp the essentially political nature of the conflict. Nor do they understand the limits of their own conventional military power in such political and operational settings. A major characteristic of such operations in our country is application of combat power to enhance "civil control" rather than cause attrition. In this respect the Indian Army is quite different from many others, including those of USA and Pakistan. The Indian Army believes such operations need to be people-centric and conducted in a manner that they generate a groundswell for stability and peace. Rules of engagement are formulated imaginatively in the backdrop of political, legal and moral parameters. The populace constitutes the "centre of gravity" and therefore winning their "hearts and minds" is central to all efforts. Effective interface with media, as part of public information and perception-management, is also necessary. Suicide terrorism, motivated by blind faith, is a strategy of coercion employed to compel a target government to change policy. Democracies are particularly vulnerable to such attacks for three reasons. First, their threshold of intolerable pain is lower than that of dictatorships. Secondly, democracies are more restrained than authoritarian regimes in use of force, and thirdly, suicide attacks may also be harder to organise or publicise in authoritarian states. The Army has been dealing with a large number of internal conflicts. It has been fighting the Naga insurgency for nearly five decades and insurgencies in practically all other north-eastern states for over 40 years. In the 80s and 90s, a large part of the Army was deployed in Punjab to tackle Sikh insurgents, who at the behest of and with the full support of Pakistan, had let loose a reign of terror. In Punjab, the Army had deliberately assumed a supportive role, with the police in the lead role, as the army did not want to alienate the populace in a state that is crucial for its operations against Pakistan. The police did a good job, but they could not have succeeded without the unobtrusive, yet crucial role played by the Army over a prolonged period in stabilising an extremely sensitive situation and bringing a modicum of confidence amongst the populace. Since l989, the Army is the lead force for operations in Jammu and Kashmir to tackle insurgency, terrorism and proxy war unleashed by Pakistan, using both indigenous and foreign insurgents, and totally backed by it in all respects. We have had two successes in the last fifty years, one in Mizoram and the second in Punjab. Both were resolved with the cooperation of the local people. Both took a long time because all counter insurgency operations are deliberate, time consuming and need a great deal of patience and perseverance. In recent decades, terrorism has been directly linked to religious fundamentalism. In South Asia, Pakistan has been exporting Jihadi fundamentalist terrorism to Jammu and Kashmir and other parts of India, as a matter of state policy. At times, it has managed to coerce some of our neighbours to assist it in this nefarious activity. Exporting terrorism is double-edged, as Pakistan is now discovering; for now they themselves have become the target of the insurgents they have trained and supported! What is of grave concern to all nations and particularly to our country is the possibility of insurgents getting hold of material for mass destruction, especially by countries like Pakistan that sponsor fundamentalism, either as state policy or by ignoring its spread. There is an ever-present danger of terrorists getting hold of nuclear, biological or chemical material, access to which must be denied by all nations as a major priority task. The Army has evolved a unique perspective for fighting insurgents and terrorists in the last six decades, since it was first employed in Nagaland. Its view has always been that it is fighting fellow-Indians, albeit misguided ones. These insurgencies had to be managed, but not in a manner that would further alienate the populace. Operationally, this led to the renunciation of heavy weapons and making the "hearts and minds" campaign a central part of the strategy. The Army believes that insurgencies are political struggles and hence their solution also lies in the political domain. Therefore, the fundamental goal is creation of conditions for restarting the political process. This is encompassed in the concept of "restoring normalcy", which requires that the level of violence be brought down for the political process to restart. It needs to be noted that the army views its role as "conflict management" and not "conflict resolution". 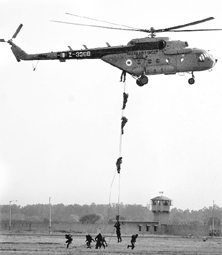 Uniqueness of the Indian doctrine is particularly dramatic when compared with similar operations by other countries. In US operations in Vietnam, Iraq and Afghanistan; Soviet intervention in Afghanistan; Israeli operations in Lebanon; Russian operations in Chechnya and operations by Pakistani Army against their own nationals, attrition has dominated with the use of heavy firepower including air power. In contrast, the Indian Army has refrained from using heavy weapons or air power, which results in collateral damage and alienates the locals. A major tenet of operations in India is the use of minimum force, creating a secure and conducive environment and finally aiming at addressing the root causes of the conflict. The underlying aspect is a humane approach towards the populace in the conflict zone and use of measured force against insurgents and terrorists. The policy underscores respect for human rights, upholding laws of the land and encourages "neuteralisation" of terrorists by surrender and apprehension rather than only seeking "kills". This strategy pays careful attention to political imperatives and thus represents a significant doctrinal evolution. The Army has paid a heavy price by incurring casualties in its efforts to save innocent persons from collateral damage. It does so to ensure that innocent civilians do not become casualties of continuing violence by terrorists who are least concerned with deaths, maiming and psychological ill effects of their actions. The huge number of Army's casualties in such actions is a testimony to the sense of duty, professionalism and the discipline of all ranks. Such suggestions spring from another wrong notion that ex-servicemen by themselves will perform at the same level they did during their stint with the military. They did well and met all challenges during their active service because they formed part of well knit, highly motivated units with abundant 'spirit-de-corps' and above all, ably commanded by officers who led them from the front and ran greater risk than their men. When these veterans are now called upon to come forward and join the Central Police Organisations (CPOs), it would be wrong to expect them to do as well as they did while in the military. In fact, and in all probability, they would very soon acquire the police culture and mores of the CPOs and descend to its level of morale and motivation. Their performance will conform to that of the CPO personnel with whom they would be so grouped. Another factor to bear in mind is that veterans are a disillusioned lot, who were discharged in the prime of their lives and denied adequate compensation for early retirement. When the same government, which continues to treat them shabbily, turned a deaf ear to their pleas for justice and fair play and retracted from all promises made even by the highest authorities in the country, calls upon them to take on yet another heavy burden - a burden which the Home Ministry's much pampered police forces' are unable to carry -- what could be their response? Are they to be once more exploited and then discarded? Surely they are not mercenaries or labourers to take up a 3-year contract to bale out the country from this ever expanding, and as the Prime Minister calls, the most serious threat to the country. If the government is serious about tackling the Maoist problem and wants to draw veterans into the fight, then it must as a first step, establish its sincerity and credibility and give them what their Supreme Commander, several prime ministers and defence ministers promised in public. The government must first win back their confidence and give them the promised One Rank-- One Pension. A soldier still falls much short of his civilian equivalent in monetary benefits and this disadvantage and disparity keeps increasing as the soldier advances in years due to the consequences of successive Pay Commissions. The government must show grace and give what it repeatedly promised. Additionally they must have the cover of the Armed Forces Special Powers Act (AFSPA.). Any serious attempt in drawing veterans into this fight and expect them to deliver calls for a worthwhile package to be put on the table for them. Among the possibilities are taking retired army personnel to organise training schools in jungle warfare and counter-insurgency operations. Besides ex-servicemen below 44 years of age, invite soldiers who are left with two years of service and give them full pension to join the new set-up. They can be enrolled for a minimum of 12 years and their pay fixed as per their length of Colour service. Form units, or at least companies of these veterans, preferably as per their regimental grouping. Draw maximum ex-servicemen from the states/areas where Maoists are active. Similarly invite retired and released short service commission officers to join units thus formed. They too must be engaged for a period of 12 years with pay to be followed by pension, over and above what is already being drawn as applicable. To start with, a formation on the lines of an infantry division be created and deployed in one of the effected states along with the state police with a joint control centre. They must also consider the inadvisability of deploying a plethora of CPOs in one area, which often results in petty rivalries. The Maoist menace is not going to go away in a hurry nor will it be possible to remove in a short span of time. It will require genuine and purposeful efforts to ameliorate the misery of the affected groups. Establish fair and friendly administration and bring about some minimum acceptable level of development.